Happy Thursday! Statement earrings are the perfect way to spice up an outfit, especially if you're wearing a solid color dress or a solid top with white denim, for example. Y'all may notice that I love to incorporate statement earrings into a lot of my outfits. I think they are SO fun. 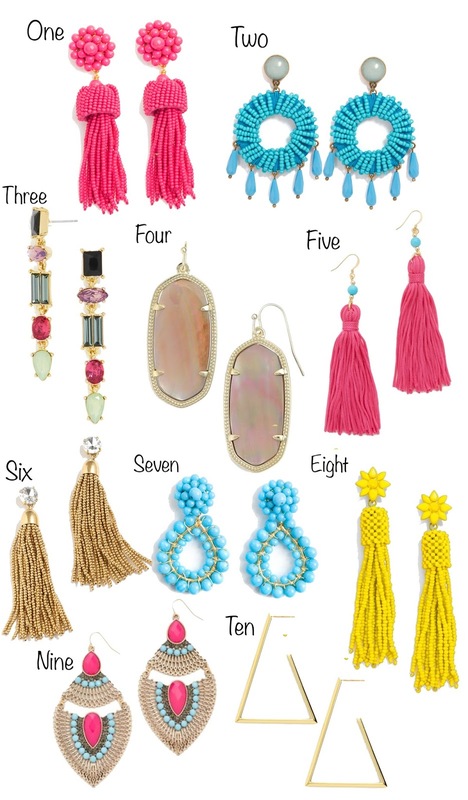 I especially love the tassel ones. I have several of these pairs pictured above and couldn't recommend them enough! My most recent purchased pairs are numbers four and ten, from the Nordstrom Anniversary Sale. I think it is always a good idea to have a trusty pair of gold earrings for a bold statement, if you're not specifically wanting to add some extra color to your outfit. I love the shape of the pair pictured above! There are just so many gorgeous pairs of statement earrings out right now! It was difficult to choose only ten to feature (I probably could have chosen fifty haha). If y'all would like to see a few posts where I have styled statement earrings, check out this, this and this one. Dying over those bright yellow beaded ones! They're all so pretty, I don't know how I can narrow it down to pick just one...or two!